So, I've been having a little trouble figuring out why this upcoming set is called "Born of the Gods". Is it because of the higher concentration of enchantment creatures? Is it because of the specific abilities that the humans have (which don't look that different from the humans in the Theros set)? It can't be a reference to Xenagos, because it's backwards compared to what he did (he was born of mortals and is now a god). If you figure it out, let me know. I've always thought the punisher mechanic was a good idea, even though competitive players deride it as bad and not the sort of thing they want in their tournaments or in the same state as them. I never dreamed, though, that we'd get a set containing a whole bunch of creatures that basically acted like punisher spells. Nessian Demolok, for example, is actually reasonably efficient regardless of which outcome you end up getting. 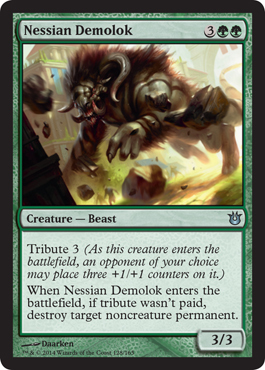 I also like that even if your opponent does manage to pay tribute, the Demolok is going to be large enough to one-shot most planeswalkers under normal circumstances. While this means they will get another activation out of whichever character is threatening you, it's still not ideal for them. Also note the "opponent of your choice" phrasing. Depending on how you feel about politics in multiplayer games, you're either smiling or wincing right now. 3/3 with Tribute 3 that either has an opponent of your choice place three +1/+1 counters or allows you to destroy target non-creature permanent. This is either a 6/6 for five, which is slightly ahead of the curve for Green though lacking any combat effects is a notable weakness, or a two for one source of card advantage. The result depends entirely on the state of the opponent's battlefield and cards in hand as they will at least lose a land if no other non-creature permanents are out, but the decision is complicated when other cards are in play. Overall this is not the best example of the Tribute keyword as other Green creatures offer more in combat than a 6/6, though the applications in Multiplayer shouldn't be overlooked. In Limited both results are more useful as a five mana 6/6 is a serious threat and even losing a land can be a major problem depending on the mana requirements of an opponent. A solid second or third pick in Booster and there is little reason not to include a copy in Sealed when running Green.